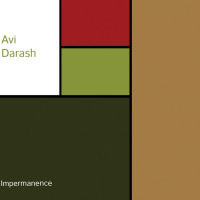 Composer/pianist Avi Darash brings both his Israeli heritage and life in Amsterdam into a musical blend which features new compositions and improvisation in equal measure. He was a finalist in the All Around Rome-Jazz Awards for ensembles in 2010, a finalist in the MIMC 2014 for classical Improvisation, and won second place at the Leiden Jazz Awards 2014. His band includes drummer Ofri Nehemya (Avishai Cohen Trio, Omer Avital, Eli Degibri, Aaron Goldberg Trio), double bassist Avri Borochov (Yama Ensemble, Yemen Blues, Itamar Borochov) and a string quartet from the Grammy winning national orchestra of the Netherlands "Metropol Orkest." The opener "Happiness" establishes that this will not be business as usual. It may be a piano trio, but the arrangement is extremely conversational. The bass and drums don't just react to the piano, they come in and out over the course of the track. Happiness finds expression in a bright, upbeat feel with distinct rhythmic shifts in the different sections. "Lullaby for Bendavid" follows on solo piano, emphasizing Darash's composer side. He returns to solo again on "The Shepherd of Dreams" and "Morenica." "Nothingness" goes through similar shifts, opening with rubato arco bass and moving into fast-paced material (with a clearly composed bass ostinato), then back again to rubato to close. The entry of the stings in "Power to the Peaceful" demonstrates Darash's compositional approach. They play unaccompanied for the first two minutes, and when the trio enters they play the theme instead of receding into accompaniment. They are an integral part of the arrangementalthough they do not improviseinstead of the typical "jazz with strings" approach. They also close the album, playing the closing "Impermanence" alone. Darash says that the title Impermanence "derives from the Buddhist teaching of reality being in a constant state of flux, change that is inevitable and consistently moving." That's a good description of the composition and performance here as well. Track Listing: Happiness; Lullaby For Benedavid; The Day After; Nothingness; Power To The Peaceful; A Three Day's Journey; The Shepherd Of Dreams; Spiritones; Morenica; Mahumudra; Impermanence. Personnel: Avi Darash: piano, composer/arranger; Avri Borchov: bass; Ofri Nehemya; Arlia de Ruiter: 1st violin (5, 11); Sarah Koch: 2nd violin (5, 11); Norman Jansen: viola (5, 11); Jascha Albracht: cello (5, 11).